With the election this week of Cardinal Jorge Mario Bergoglio to the giddy heights of Bishop of Rome, Vicar of Christ, Successor of the Prince of the Apostles, Supreme Pontiff of the Universal Church, and Occasional Midfielder for the Vatican First XI, the Church of Rome took all manner of new and courageous steps. He is the first Jesuit - an order long considered suspicious by the Vatican for its emphasis on poverty and its refusal to have secret Swiss bank accounts - he is the first non-European to lead the church in over 1,000 years (although, God be praised, he more or less comes from Europe, so he's not altogether without culture) and he is the most simple man ever to sit on the Chair of St Peter. Indeed, much has been made of how simple he is ever since he was named as Pope. The media has been beside itself to describe just how simple a man he is - he takes the bus, he doesn't wear the kind of bling jewellery other prelates wear, he washes people's feet. But, in breaking news, I can report a little more on just how simple a man he is. Curious to know more about this new papal father, I called up an old friend, Cardinal G. and he kindly offered to give me the inside word on this simple new Pope. Pope Francis - all rather simple. 'Quite,' I said, rather nonplussed by the news. 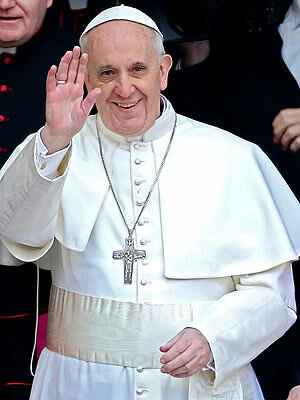 'So what can we expect from this simple pope?' I enquired. And there you have it, all rather simple, really. I would have thought that the moniker 'Simon' would have been more apt than 'Francis'!